In two days, my family and I are leaving for a week-long holiday, so naturally, it's time for me to prepare. My last holiday to Prague with my parents was just under a year ago, and I'm itching to get going now that I know that this holiday is so close. This year, we're going on another city break, although somewhere a little warmer than Prague in October. Since that last holiday was the first one that I had ever properly documented through social media, I had been keen to take stylish clothes and decent makeup to keep up appearances as it were, and this holiday will be no different. I suppose the only difference this time is that I have a blog and complete freedom over my Instagram theme, as opposed to last year when I was posting mainly poetry to my account. Although I will be sharing a mighty long post when we return from our holiday, I'd also quite like to share a mighty long post now about preparing for a holiday when you care as much about appearances as I do. Documenting a holiday through Instagram, through filtered photos and selfies, all sounds incredibly narcissistic, and I'm going to just own it, because I'm damn sure that I'm not the only one that thinks this way in this day and age. 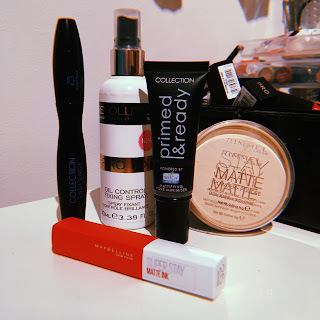 So, here are the ways that I, a narcissist, am preparing for my holiday, both what I have done beforehand to kickstart the adventure, and the items that I will be taking with me to keep myself looking and feeling good. 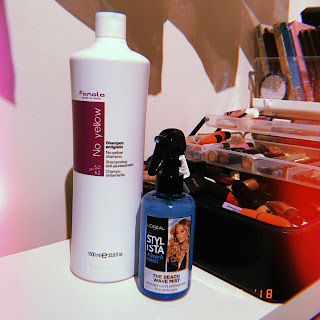 Getting back into Game of Thrones has once again given me a desire for silvery blonde hair à la Daenerys Targaryen, and the only thing that has given me any significant results as of late is the Fanola No Yellow Shampoo. 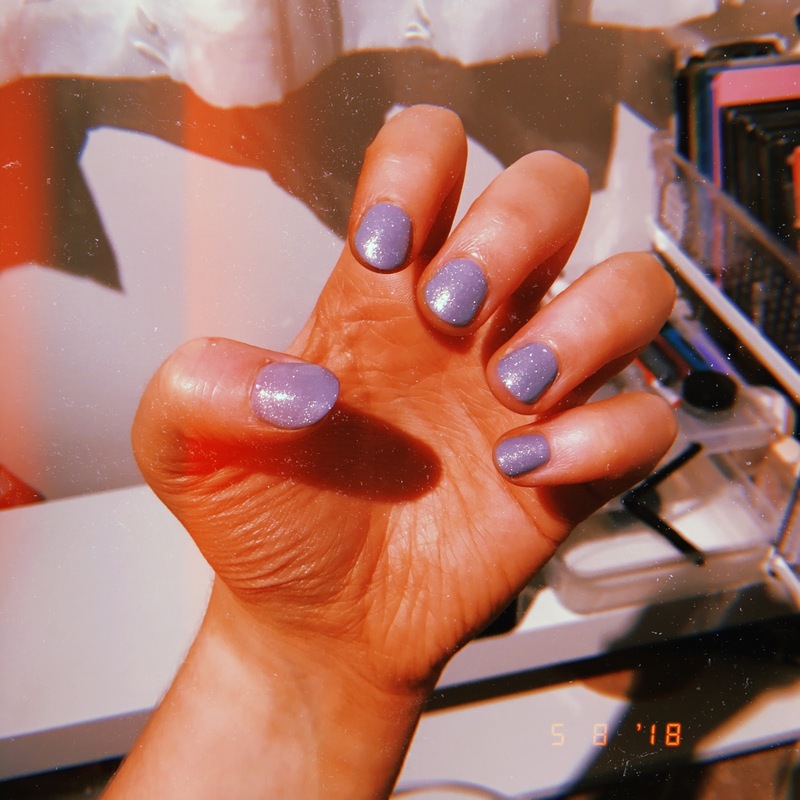 It's so purple that you need gloves to apply it to your hair or your fingernails will look like you've been out in the cold too long, but it works wonders for blonde hair that is starting to look a bit brassy. Bring on those silver tones and call me Mother of Dragons. I'll also be taking some sort of salt spray with me so that I can wear my hair in beachy waves while we're away, which is far easier than battling it out with the straighteners every morning. Messy hair requires the least upkeep, and it looks as effortless as it feels. If I'm going to be out and sweating in the sun all day, I might as well start with messy curls that will stay all day rather than trying to get my hair to be sleek and straight. Since I got a spray tan before my graduation back in June, I've had a tiny bit of a tan obsession (or at least an obsession with not looking pale). 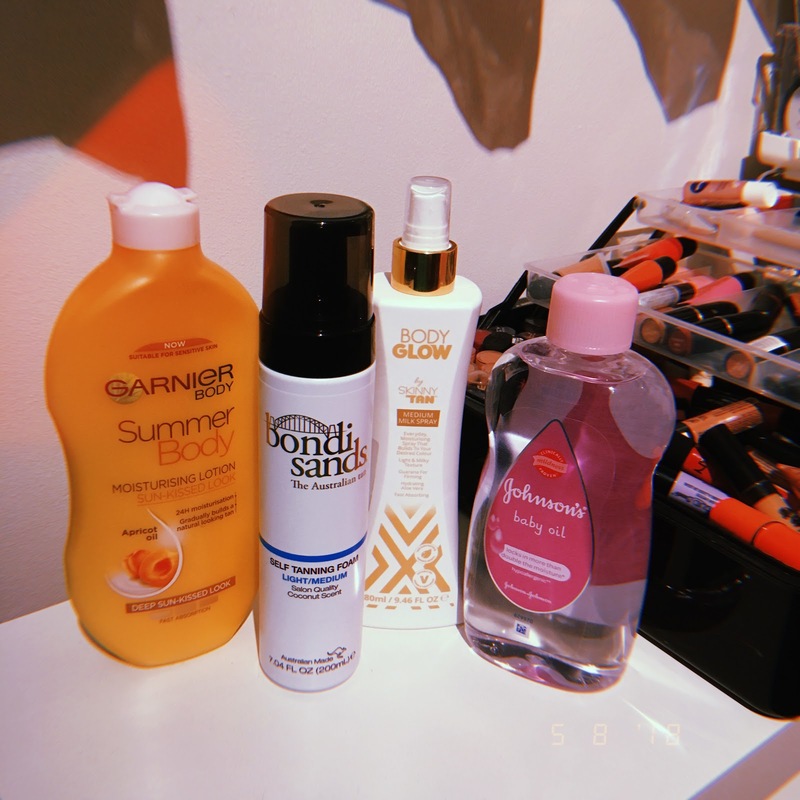 My long-time favourite, the Rimmel Sunshimmer Instant Tan with Gradual Glow, has taken a back seat in favour of Skinny Tan's Body Glow Milk Spray in the shade Medium, which is so easy to apply and build up into a natural-looking, transfer-resistant tan that I can't believe I ever used anything else. Garnier's Summer Body Moisturising Lotion in the shade Deep Sunkissed Look is lovely to add after applying the Skinny Tan, what with its apricot scent and the way that it leaves your skin feeling ridiculously soft. However, for a week-long holiday, I'll be needing something that requires a little less upkeep, so while I'll still be taking either my Skinny Tan or my Garnier with me to maintain my glow, I'm also taking the advice of a friend and using the Bondi Sands Self Tanning Foam in the shade Light/Medium before we leave on the Wednesday morning. The next few days are going to be full of shaving with baby oil (which is messy but works absolute wonders), slathering myself in hair-removal cream, and making sure that my tan doesn't go overboard. Blonde hair and orange skin isn't exactly a good combo in the current political climate. I'm currently tapping out this post with freshly-painted nails. Tonight was the first time that I have ever had my nails professionally done, and they feel fantastic. They are the most gorgeous shade of bluish-grey with a duo-chrome topper, perfect for a city break. My nails may be short and thin, but at least they are now sophisticated and shimmery. My everyday necessities are of course coming with me in my makeup bag. I'll need products like my Rimmel Stay Matte Powder, my Makeup Revolution Pro Fix Oil Control Fixing Spray, and my Collection Primed & Ready Primer to stop my face from getting sweaty and shiny while we're walking around, as well as my Collection Lash Surge Mascara in the waterproof formula which stays put through anything. Speaking of staying put, my Maybelline Super Stay Matte Ink Liquid Lipsticks will certainly be coming with me. It's not as if I won't get a spare second to reapply some lippy, but it is far much more convenient to simply wear lipstick that does not budge. The shade Heroine is one that I will be taking: not only is the shade gorgeous and vibrant, but the formula is one that stays on the lips all day, so I will be able to eat and drink and sweat as much as I want, and the colour will not fade. Where we're going, the weather will be warm, and we'll obviously be keeping active and walking a lot, so comfort is a must when it comes to clothes. My new Skechers and my very old Converse trainers will be coming with me as both are the epitome of comfortable footwear. I have yet to sort through my clothes to decide what I am taking, but I know that shorts with elasticated waistbands and loose/cropped tops will be essential. A thin raincoat might sneak its way into my bag as well, just in case the weather turns. I'll probably be posting plenty of pictures of outfits and such over on my Instagram, so there'll be no shortage of photos. Not that anyone was worried about that, but still. I've been feeling good about myself these last few months, and I'd like that to continue into my holiday.